For the athlete, see Lucinda Williams (athlete). Williams has released a string of albums since that have earned her more critical acclaim and commercial success. She has won 3 Grammy Awards, from 15 nominations, and received 2 Americana Awards, from 12 nominations. Additionally, Williams ranked No. 97 on VH1's 100 Greatest Women in Rock & Roll in 1998, and was named "America's best songwriter" by Time magazine in 2002. Williams was born in Lake Charles, Louisiana, the daughter of poet and literature professor Miller Williams and an amateur pianist, Lucille Fern Day. Her parents divorced in the mid-1960s. Williams's father gained custody of her and her younger brother, Robert Miller, and sister, Karyn Elizabeth. Like her father, she has spina bifida. Her father worked as a visiting professor in Mexico and different parts of the United States, including Baton Rouge; New Orleans; Jackson, Mississippi; and Utah before settling at the University of Arkansas in Fayetteville. Williams never graduated from high school but was accepted into the University of Arkansas. Williams started writing when she was 6 years old and showed an affinity for music at an early age, and was playing guitar at 12. Williams's first live performance was in Mexico City at 17, as part of a duo with her friend, a banjo player named Clark Jones. By her early 20s, Williams was playing publicly in Austin and Houston, Texas, concentrating on a folk-rock-country blend. She moved to Jackson, Mississippi, in 1978 to record her first album, for Smithsonian/Folkways Records. Titled Ramblin' on My Mind, it was a collection of country and blues covers. The album title was shortened to Ramblin' when it was reissued. She followed it up in 1980 with Happy Woman Blues, which consisted of her own material. Neither album received much attention. In the 1980s, Williams moved to Los Angeles, California (before finally settling in Nashville, Tennessee), where, at times backed by a rock band and at others performing in acoustic settings, she developed a following and a critical reputation. While based in Los Angeles, she was briefly married to Long Ryders drummer Greg Sowders, whom she had met in a club. In 1988 Rough Trade Records released the self-titled Lucinda Williams, which was produced by Gurf Morlix. The single "Changed the Locks", about a broken relationship, received radio play around the country and gained fans among music insiders, including Tom Petty, who would later cover the song. Its follow-up, Sweet Old World (Chameleon, 1992), also produced by Morlix, is a melancholy album dealing with themes of suicide and death. Williams' biggest success during the early 1990s was as a songwriter. Mary Chapin Carpenter recorded a cover of "Passionate Kisses" (from Lucinda Williams) in 1992, and the song became a smash country hit for which Williams received the Grammy Award for Best Country Song in 1994. Carpenter also received a Grammy for her performance of the song. She duetted with Steve Earle on the song "You're Still Standin' There" from his album I Feel Alright. In 1991, the song "Lucinda Williams" appeared on Vic Chesnutt's album West of Rome. Williams had garnered considerable critical acclaim, but her commercial success was moderate. Emmylou Harris said of Williams, "She is an example of the best of what country at least says it is, but, for some reason, she's completely out of the loop and I feel strongly that that's country music's loss." Harris recorded the title track from Williams's Sweet Old World for her career-redefining 1995 album, Wrecking Ball. The long-awaited release, 1998's Car Wheels on a Gravel Road, was Williams' breakthrough into the mainstream and received a Grammy Award for Best Contemporary Folk Album. Containing the single "Still I Long for Your Kiss" from the Robert Redford film The Horse Whisperer, the album received wide critical notice and soon went gold. The single "Can't Let Go" also enjoyed considerable crossover radio play. Williams toured with Bob Dylan, the Allman Brothers and Tom Petty and the Heartbreakers, and on her own in support of the album. An expanded edition of the album, including three additional studio recordings and a second CD documenting a 1998 concert, was released in 2006. In 1999, she appeared on Return of the Grievous Angel: A Tribute to Gram Parsons, duetting with David Crosby on the title track of the tribute album. Williams followed up the success of Car Wheels with Essence (2001). This release features a less produced, more down-tuned approach both musically and lyrically, and moved Williams further from the country music establishment while winning fans in the alternative music world. She won the 2001 Grammy Award for Best Female Rock Vocal Performance for the single "Get Right with God," an atypically uptempo gospel-rock tune from the otherwise rather low-key release. The title track includes a contribution on Hammond organ by alternative country musician Ryan Adams. In 2006, Williams recorded a version of the John Hartford classic "Gentle on My Mind," which played over the closing credits of the Will Ferrell film Talladega Nights: The Ballad of Ricky Bobby. Williams was a guest vocalist on the song "Factory Girls" from Irish punk-folk band Flogging Molly's 2004 album, "Within a Mile of Home," and appeared on Elvis Costello's The Delivery Man. She sings with folk legend Ramblin' Jack Elliott on the track "Careless Darling" from his 2006 release "I Stand Alone." In 2007, Williams released West, for which she wrote more than 27 songs. The album was released on February 13, 2007. It addresses her mother's death and a tumultuous relationship break-up. Vanity Fair praised it, saying "Lucinda Williams has made the record of a lifetime—part Hank Williams, part Bob Dylan, part Keith Richards circa Exile on Main St. ..."
In the fall of 2007, Williams announced a series of shows in Los Angeles and New York. Playing five nights in each city, she performed her entire catalog on consecutive nights. These albums include the self-titled Lucinda Williams, Sweet Old World, Car Wheels on a Gravel Road, Essence, and World Without Tears. Each night also featured a second set with special guest stars. Some of the many special guests included Steve Earle, Allison Moorer, Mike Campbell, Greg Dulli, E, Ann Wilson, Emmylou Harris, David Byrne, David Johansen, Yo la Tengo, John Doe, Chuck Prophet, Jim Lauderdale and Shelby Lynne. In addition, each night's album set was recorded and made available to the attendees that night. These live recordings are currently available on her website and at her shows. The next album from Williams wrapped recording in March 2008. Titled Little Honey, it was released on October 14 of that year. It includes 13 songs—among them, "Real Love" and "Little Rock Star," the latter inspired by music celebrities in the press, like Pete Doherty and Amy Winehouse. "Little Honey" also includes a cover of AC/DC's "Long Way to the Top" and "Rarity," inspired by singer-songwriter Mia Doi Todd. In July 2008, though "Little Honey" had yet to be released, Paste magazine.com listened to an advance copy and rated the duet between Williams and Elvis Costello on the song "Jailhouse Tears" as the No. 5 all-time greatest country/rock duets. Williams released a cover of Shel Silverstein's "The Ballad of Lucy Jordan" in June 2010 as part of the Twistable, Turnable Man tribute album. 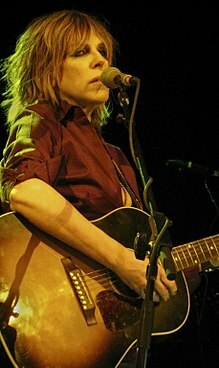 Her 2008 concert appearance at the Catalyst, Santa Cruz, contained an announcement by the city's mayor that September 6, 2008 would henceforth be Lucinda Williams Day. On March 1, 2011, Williams released the album Blessed. In September 2012, she was featured in a campaign called "30 Songs / 30 Days" to support Half the Sky: Turning Oppression into Opportunity for Women Worldwide, a multi-platform media project inspired by Nicholas Kristof and Sheryl WuDunn's book. In 2012 and 2013 Williams went on U.S. tour accompanied only by guitarist Doug Pettibone. On September 30, 2014, Williams released her eleventh studio album, Down Where the Spirit Meets the Bone, the first album on her Highway 20 Records label. In 2015, Williams provided backup vocals for the Don Henley song "Train in the Distance" on his album Cass County. On February 5, 2016, Williams released the album The Ghosts of Highway 20 and performed on The Late Show with Stephen Colbert on February 17, 2016. On June 29, 2018 Blue Note Records will release Vanished Gardens by Charles Lloyd & the Marvels which features Lucinda on five tracks. Marvels members Bill Frisell and Greg Leisz have previously worked with Williams, including on Car Wheels on a Gravel Road. In May 2017, Lucinda was awarded an Honorary Doctorate of Music from Berklee College of Music during the 2017 Commencement Concert. In June, Rolling Stone named Williams one of the 100 Greatest Country Artists of All Time. Later that year, she re-recorded and expanded her 1992 "Sweet Old World" album, this time titled "This Sweet Old World". During the 1980s, Williams was briefly married to Long Ryders drummer Greg Sowders. In September 2009 she married Tom Overby, an executive from Best Buy's music department, who is also her manager. The marriage ceremony was performed on stage by her father. A Did not chart when first released in 1988. When reissued in 2014 it reached number 39. B Reached number 25 on the Top Heatseekers chart. C Reached number 14 on the RPM Country Albums chart. 2012 – Marvin Etzioni – "Lay It on the Table" on Marvin Country! The Americana Awards are presented annually by the Americana Music Association and celebrate outstanding achievement in americana music. Williams is one of the most nominated artists in the history of the awards show with 12, including 2 wins. The Grammy Awards are awarded annually by the National Academy of Recording Arts and Sciences of the United States for outstanding achievements in the record industry. Williams has received three awards in three separate categories (country, folk and rock) from 15 nominations that span five genres (pop, rock, country, folk and americana). The American folk/rock band Augustana references the musician in the song "Meet You There," on their studio album Can't Love, Can't Hurt. The lyrics state, "Just put on Lucinda, Baby, and dance with me." She is also referenced by the character Kathleen "Kat" Hall played by Mireille Enos in the film If I Stay. ^ a b Lucinda Williams biography. AllMusic. Retrieved on October 7, 2008. ^ "VH1: 100 Greatest Women of Rock & Roll". Rock On The Net. Retrieved July 9, 2017. ^ "'Essence' of the South" Archived 2008-12-11 at the Wayback Machine. CNN/TIME. Retrieved on October 7, 2008. ^ Lewine, Edward. "Domains : Lucinda Williams : Country House". New York Times. Retrieved 2014-04-24. ^ Buford, Bill (5 June 2000). "Delta Nights: A Singer's Love Affair with Loss". New Yorker. Retrieved 22 July 2014. ^ Bukowski, Elizabeth. "Lucinda Williams" Archived 2008-07-09 at the Wayback Machine Salon. Retrieved on January 11, 2000. ^ Gamboa, Glenn. "With 'Honey,' life is sweet for Lucinda Williams". PopMatters. October 13, 2008. ^ "OMN Best of 2011: Waterfront Blues Festival 2011: Lucinda Williams brings her 'Happy Woman' Blues to Portland". Oregon Music News. Archived from the original on 5 August 2012. Retrieved 17 June 2013. ^ "30 Songs / 30 Days for Half the Sky | Half The Sky". Halftheskymovement.org. 2012-08-30. Archived from the original on 2012-10-14. Retrieved 2012-09-17. ^ "Lucinda Williams and Doug Pettibone at The Birchmere Music Hall". 2012-08-20. Archived from the original on 2012-08-28. Retrieved 2013-05-24. ^ Deming, Mark. "Down Where the Spirit Meets the Bone: Overview" AllMusic (Accessed October 5, 2014). ^ Don Henley – Train in the Distance (Audio). 11 September 2015 – via YouTube. ^ "Lucinda Williams Receives Honorary Doctorate From Berklee". The Boot. Retrieved 12 January 2018. ^ "Lucinda Williams Bio". Rolling Stone. Retrieved 8 April 2018. ^ "Lucinda Williams Chart History: Adult Top 40". Billboard. ^ "Lucinda Williams Chart History: Adult Alternative". Billboard. Retrieved 10 February 2018. Top 50 peaks: "australian-charts.com > Lucinda Williams in Australian Charts". Hung Medien. Retrieved 2019-04-10. Top 100 peaks to December 2010: Ryan, Gavin (2011). Australia's Music Charts 1988–2010 (pdf ed.). Mt. Martha, VIC, Australia: Moonlight Publishing. p. 302. All ARIA chart peaks to April 10, 2019: "Response from ARIA re: Lucinda Williams chart history, received April 10, 2019". Imgur.com. Retrieved 2019-04-10. N.B. The High Point number in the NAT column represents the release's peak on the national chart. ^ Artist Chart History Albums – Lucinda Williams. Billboard. Retrieved on October 7, 2008. ^ Heatseekers – Sweet Old World. Billboard. Retrieved October 7, 2008. ^ "Bruce Cockburn, Breakfast in New Orleans, Dinner in Timbuktu". Musicbrainz.org. Retrieved October 31, 2012. ^ "Lucinda Williams chooses acclaim over fame any day". CNN. February 4, 1999. ^ "The Grammy Winners". The New York Times. March 3, 1994. ^ "Grammys 2002: The winners". BBC News. February 28, 2002. ^ Layus, Dan. "Lyrics". Metro Lyrics. Sony. Retrieved 7 December 2016. Wikimedia Commons has media related to Lucinda Williams.